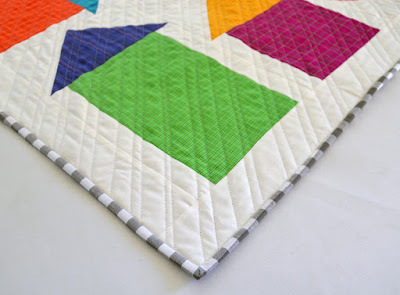 It's time for more Warp & Weft inspiration! 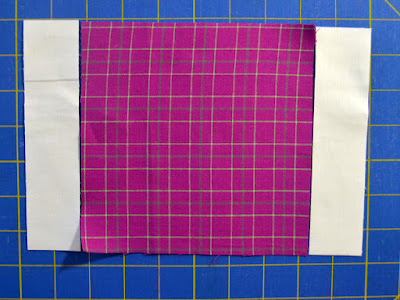 Today we're sharing a tutorial using these yarn dye fabrics. 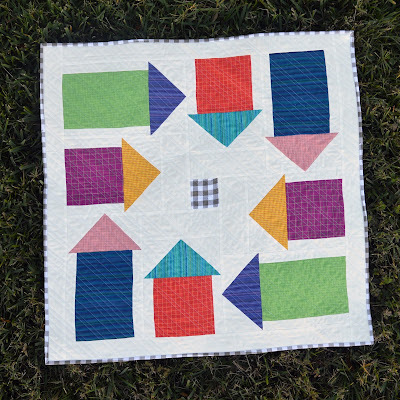 Cozy woven prints are perfect for classic house blocks, but the bright colors of the Warp & Weft collection create a table topper with a modern feel that pops against a soft white background. 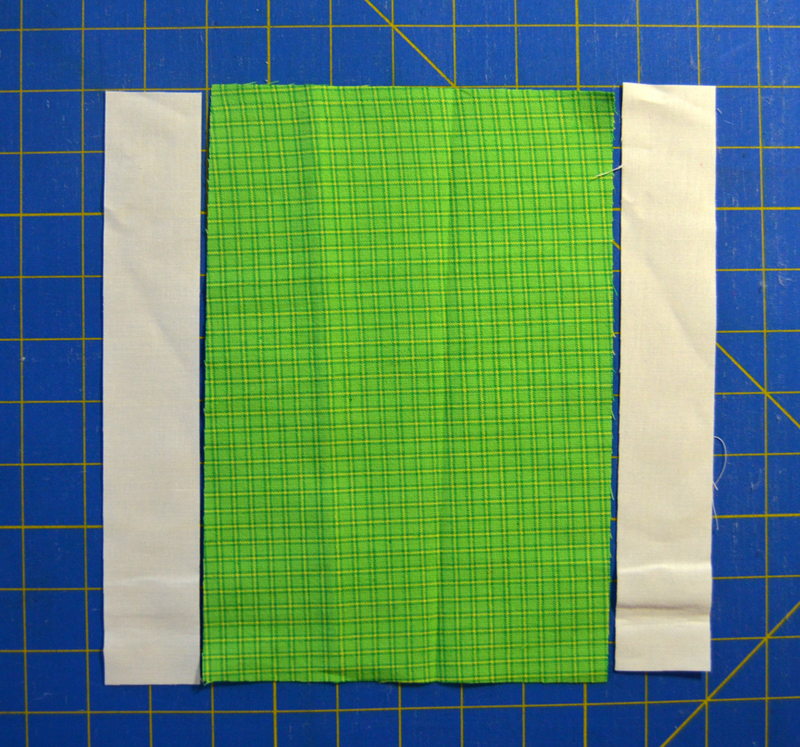 Step 1: Sew 1-1/2" x 9-1/2" off-white strips to opposite sides of (1) 6-1/2" x 9-1/2" green plaid piece to make a house unit. Step 2: Draw a diagonal line on the wrong side of (2) 4-1/2" off-white squares. 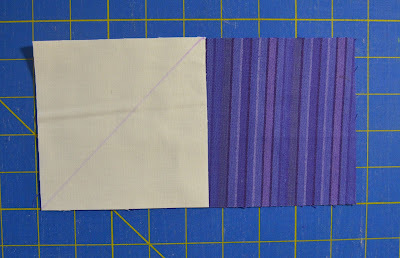 Position a marked square on the left end of (1) 4-1/2" x 8-1/2" purple stripe piece. Sew on the drawn line and trim seam allowance to 1/4". Press open. Repeat on the opposite end with the second marked square to make a roof unit. 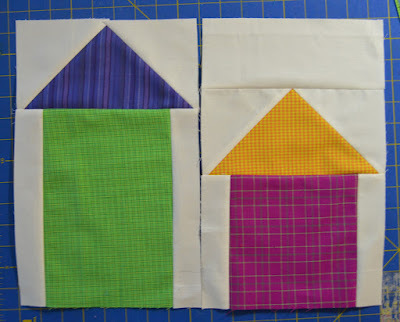 Step 3: Sew the roof unit to the top of the house unit from Step 1 to make a tall house block measuring 8-1/2" x 13-1/2". 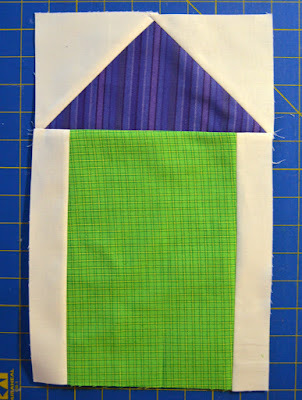 Step 4: Make a second green plaid/purple stripe tall house block. In the same way, make (2) pink plaid/blue stripe tall house blocks. 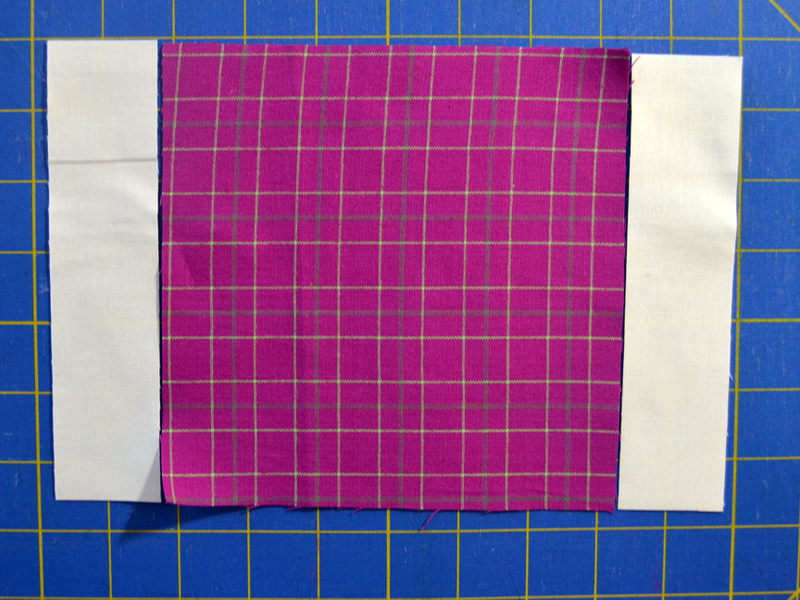 Step 5: Sew 1-1/2" x 6-1/2" off-white strips to opposite sides of (1) 6-1/2" magenta plaid square to make a house unit. Step 6: Make a roof unit using (1) 4-1/2" x 8-1/2" gold check piece and (2) 4-1/2" off-white squares. 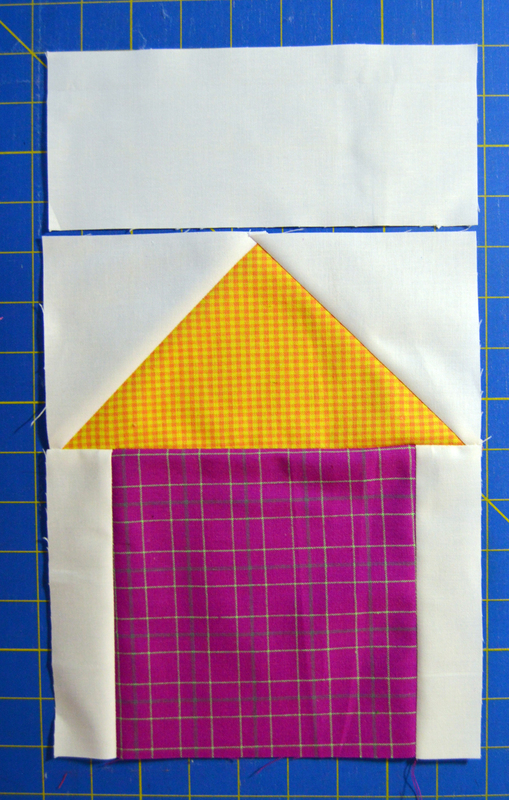 Sew together (1) house unit, (1) roof unit, and (1) 3-1/2" x 8-1/2" off-white piece to make a short house block measuring 6-1/2" x 9-1/2". 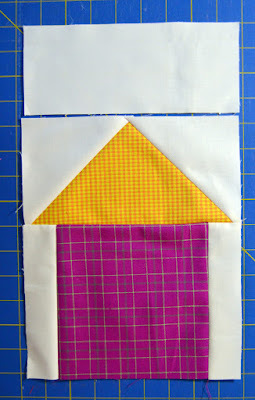 Step 7: Make a second gold check/magenta plaid short house block and (2) orange plaid/turquoise stripe short house blocks. Step 8: Sew blocks together in pairs as shown. Make (2) of each combination. 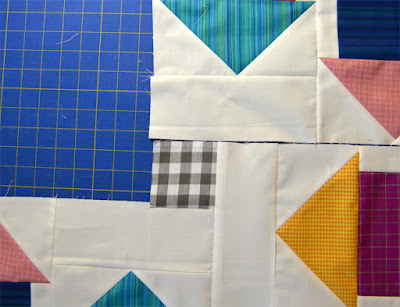 Step 9: Attach the paired block units to the 3-1/2" gray/white check center square using partial seam piecing techniques. Begin by sewing the square to the upper right corner of a paired block unit as shown below, stopping 1/4" before the side edge. 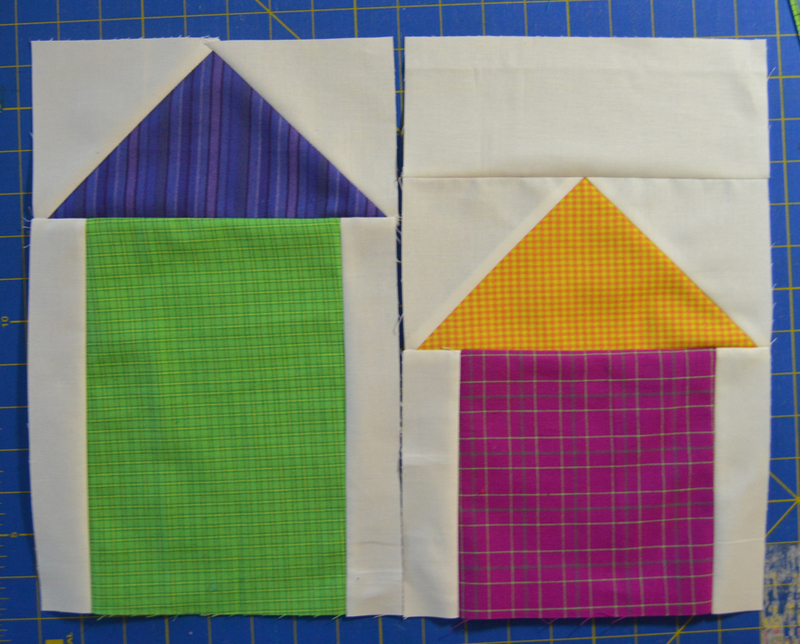 Step 10: Press open and add the next paired block unit as shown. 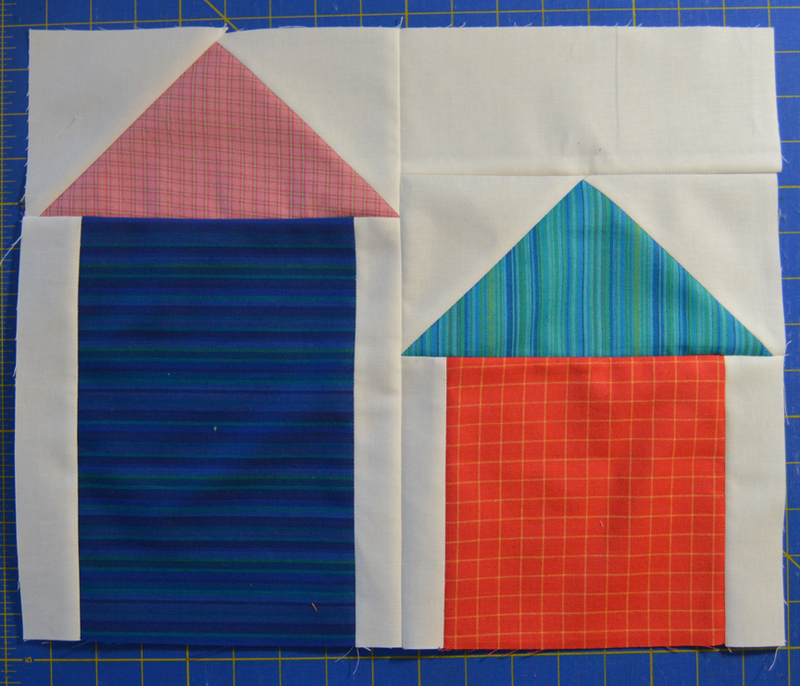 Continue, adding the third paired block unit as shown. 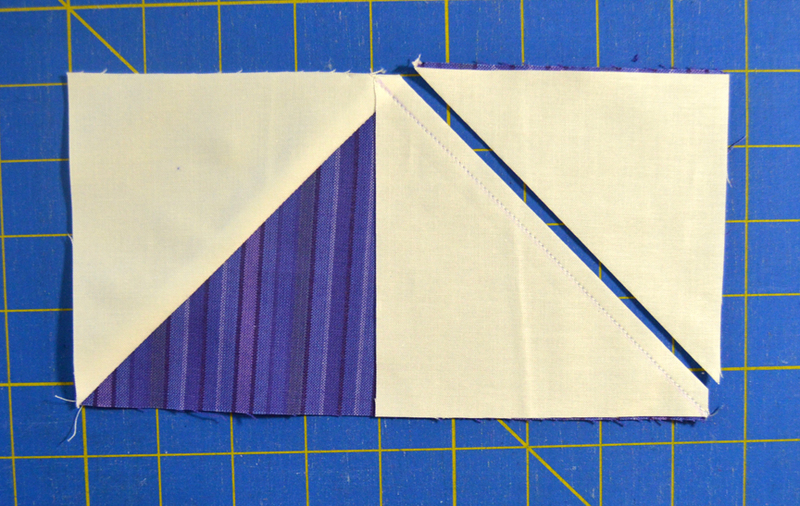 Add the last paired block unit, completing the partial seam from Step 9. Step 11: Trim (2) 2-1/2" x WOF off-white strips to measure 29-1/2" long. 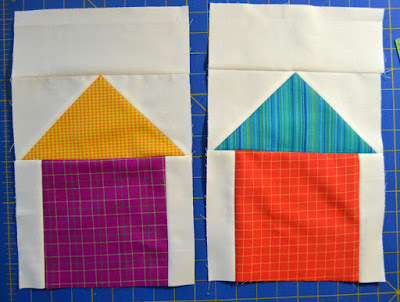 Sew to the sides of the quilt center. Trim (2) 2-1/2" x WOF off-white strips to measure 33-1/2" long. 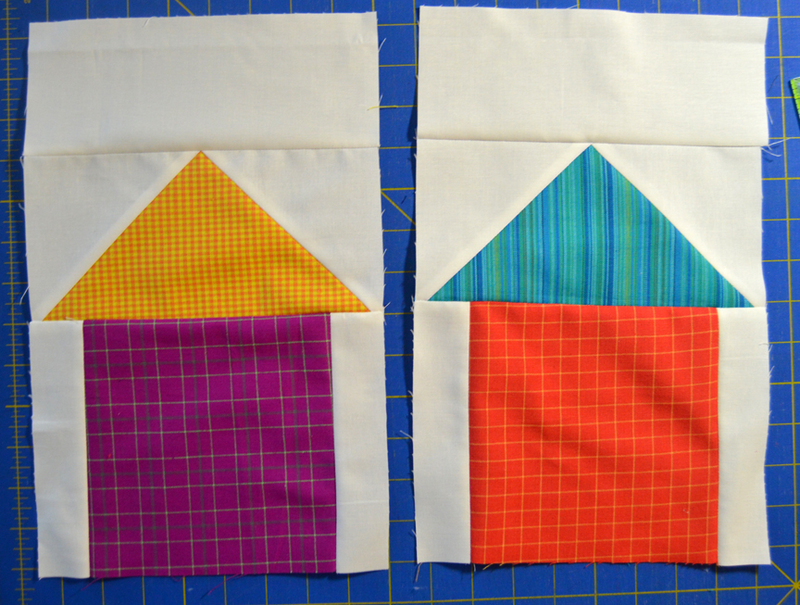 Sew to the top and bottom of the quilt. 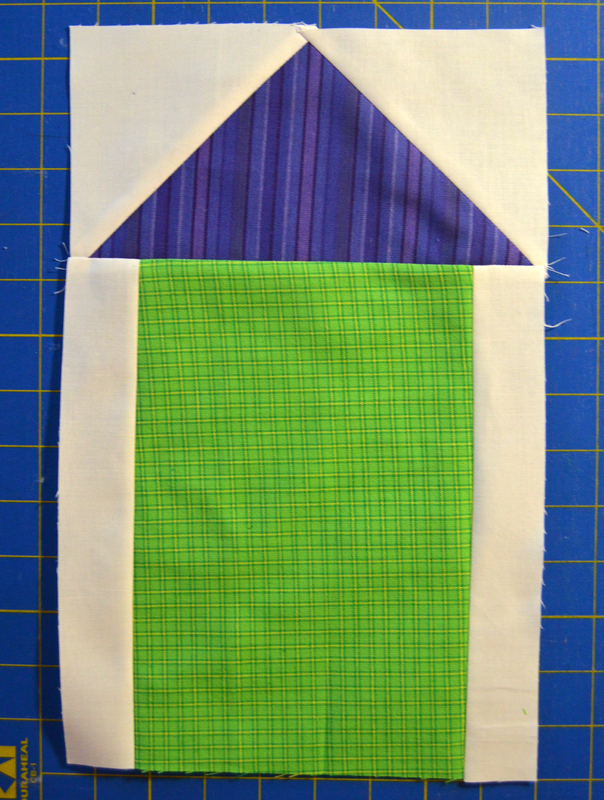 Step 12: Layer the backing right side down, batting, and quilt top right side up. 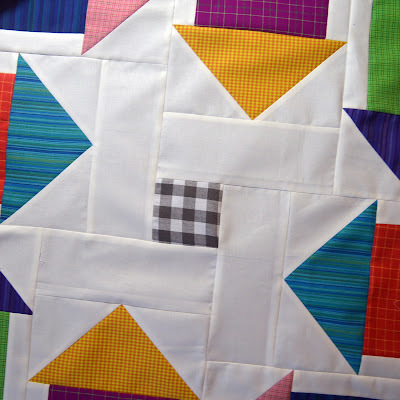 Baste the layers together, quilt as desired, and trim backing and batting even with the quilt top. 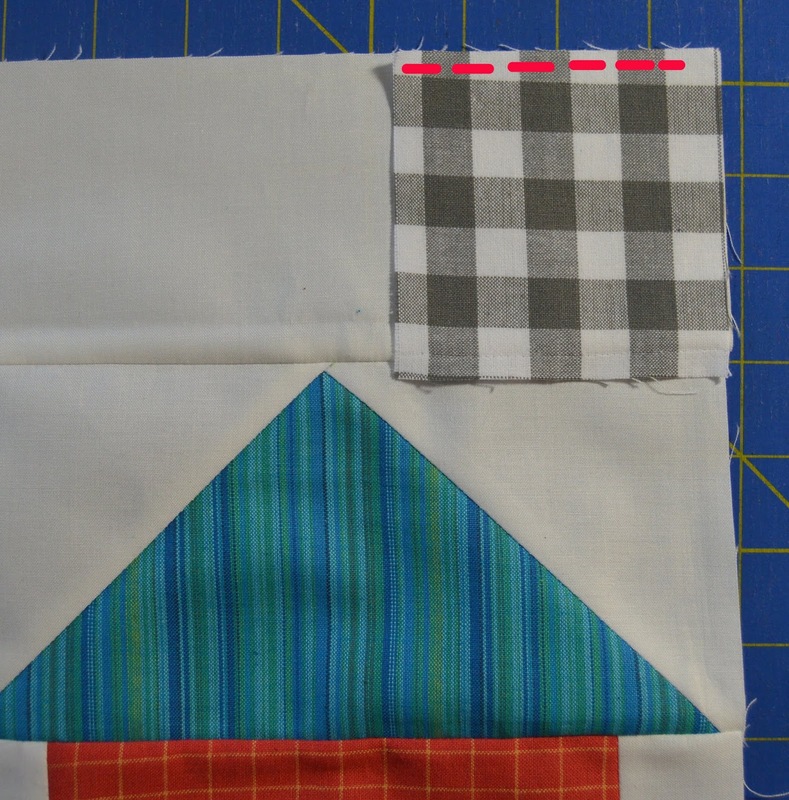 Use the (4) 2-1/4" x WOF gray/white plaid strips to bind the quilt. Love the texture in these yarn dye fabrics! Isn't the large plaid a fun binding?! Love the Warp & Weft fabrics? Leave a comment below letting us know which is your favorite for a chance to win a fat quarter bundle of 8-10 of these prints. Giveaway ends January 18th at 11:59 pm EST. Want to see more Warp & Weft fun? Click here to read an interview with Weeks and Bill about their new collection. Click here to see the entire Warp & Weft collection. 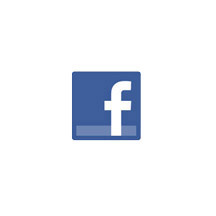 Visit Weeks and Bill's website. Click here to read Debby Kratovil's Technique Tuesday post. I love any and all stripes. THE BLUE+PURPLE! LOVE ALL OF THEM! THANKS FOR THE GIVEAWAY!!! My favorite color and fabric? 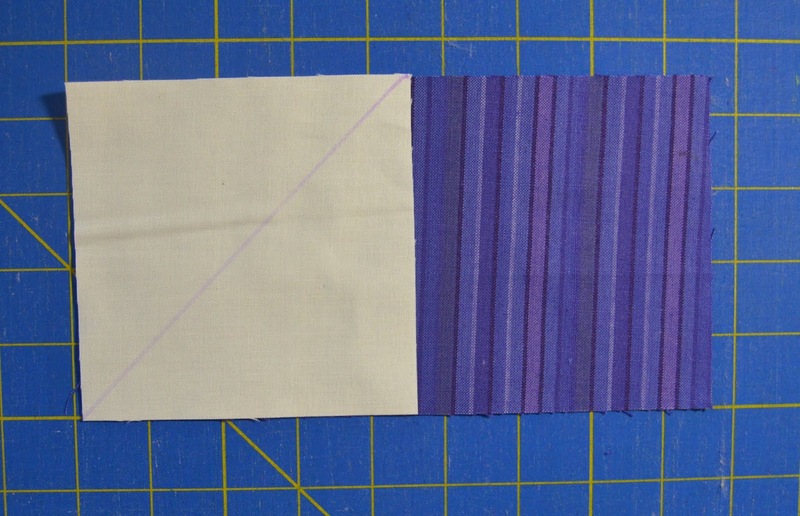 Purple Stripe Purple! My favorite is the magenta one you used in step 5. All of them are great. 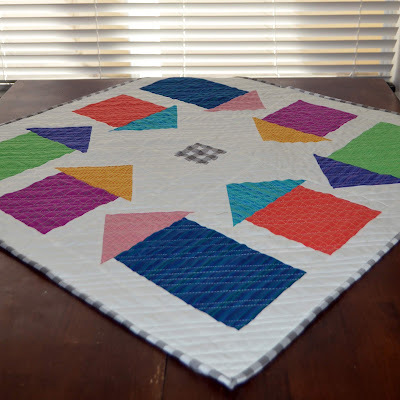 Would make a cute baby quilt! What is the finished measurement of the topper? Love the bright colours!! Cute table topper too! My favorite is the multi stripe aqua and a close 2nd, almost a tie, is the checkerboard gray! The whole line is wonderful. 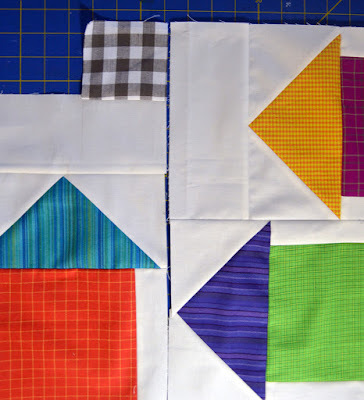 I like the small dainty plaids that almost read as solids! Beautiful fabrics. My favorite is the gold check. 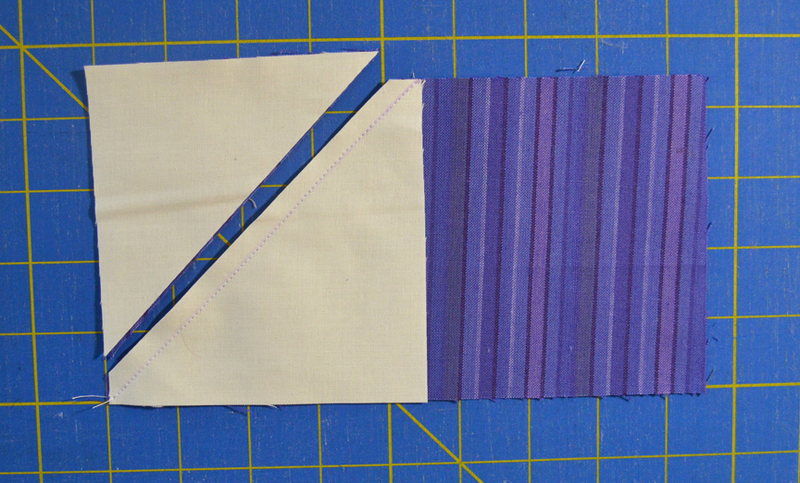 Love the stripe fabrics, but they would be lonely without the other fabrics. Thanks for the giveaway and sharing all the quilt pictures. How can one choose? Love all stripes and plaids! I love the tiny plaids and mini ginghams. My favorite is the dark blue in step 2. Nice fabrics, and cute quilt. All of these fabrics are attractive. My favorite is the purple stripe. Thanks you for the pattern and the opportunity to win some fat quarters. These are great, so it's hard to choose, but if pressed I'd say the Blue Stripe Blue. I love the green and the orange but they are all great. Oh my, that quilt is super cute! 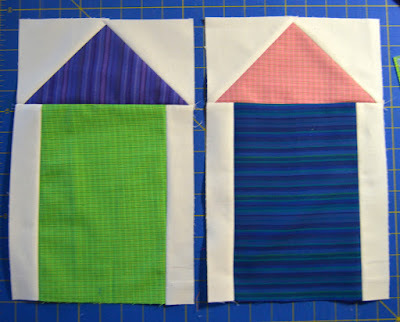 The fabrics are great, they would work in so many quilts. I especially love the stripes in shades of turquoise and blue. I have been collecting warp and weft fabric for a while now and just waiting for inspiration to hit... and now you have done it for me... just love the feel of them and the shimmer of the solids.. the stripes are my favorite. blue and purple. I love all the crayon colors--brights are my favorites! I think all of them are very pretty. They are color-rific, vibrant, brightly bold and happy colors. 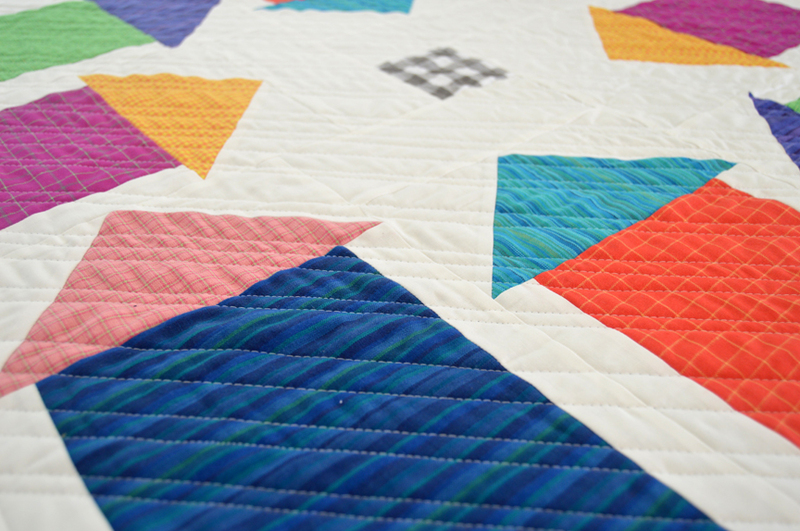 They really pop and make a Happy neighborhood quilt. I would love to add flowers and trees to mine when I win this beautiful bundle. 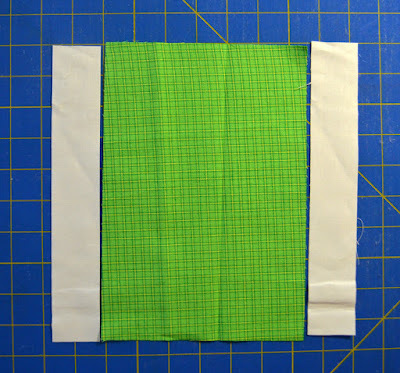 My most favorite colors are the orange plaid and the bright lime green plaid also the turquoise color. Stunning fabric colors.